Gotta love fried pickles. I mean, these are seriously good! 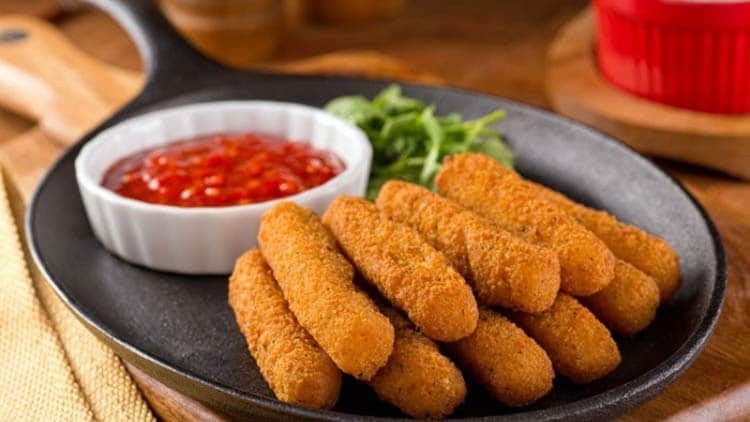 They are one of those appetizers that I can fall for again and again. 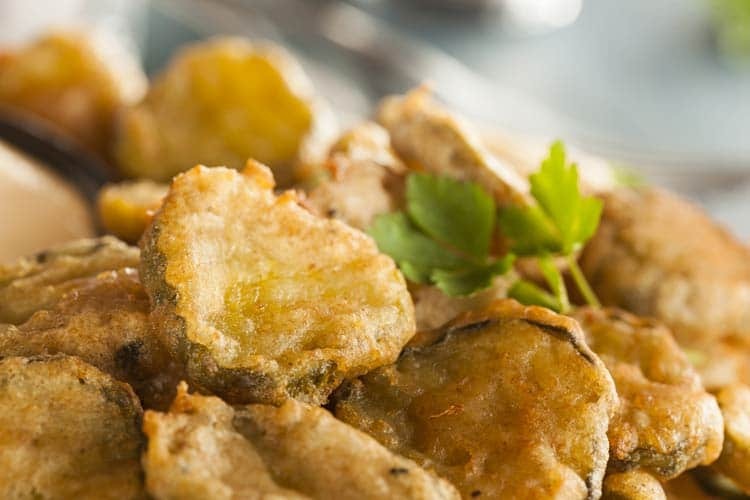 And this fried pickles recipe is so good! I’m not usually a huge fried food lover, just because I try to eat healthier foods when I have the choice. But, sometimes I’ll give into the whole flavor aspect that is fried food and indulge. I figure I’m not doing anything gluttonous if I only partake now and again. And let me tell you, these Copycat Texas Roadhouse Fried Pickles are totally worth the indulgence. Simple food recipes like this are what life is all about. As in–there are some simple pleasures in life that need to be indulged in. Easy appetizers like these Deep Fried Pickles, Copycat Bubba Gump Popcorn Shrimp, Easy Fried Mozzarella Sticks, and Gluten-Free Shrimp Dip Recipe. 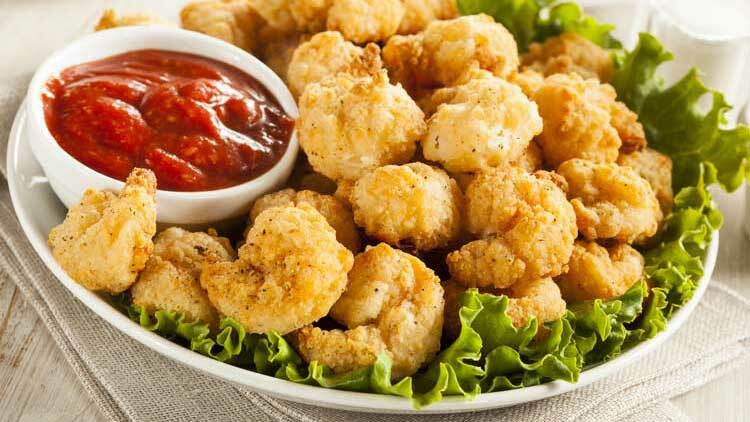 Just check out our copycat Bubba Gump Popcorn Shrimp below. If you like fried food, and you LOVE shrimp, you’ll want to try this recipe for sure. As long as you have your fryer out, you might as well make a smorgasbord of fried food appetizer-type foods! There are some things in life that are simply too good for words. These fried pickles are a divine example of just that. The salty tang of the pickles is balanced perfectly with a delectable dipping sauce that has just the right amount of kick. Believe it or not, you can make these easily at home in your deep fryer to surprise your guests, or your family. We highly recommend using a deep fryer instead of frying food on the stove top. That’s just our preference! However, if you’re an old pro…fry that food up however you’ve been doing it for all these years! 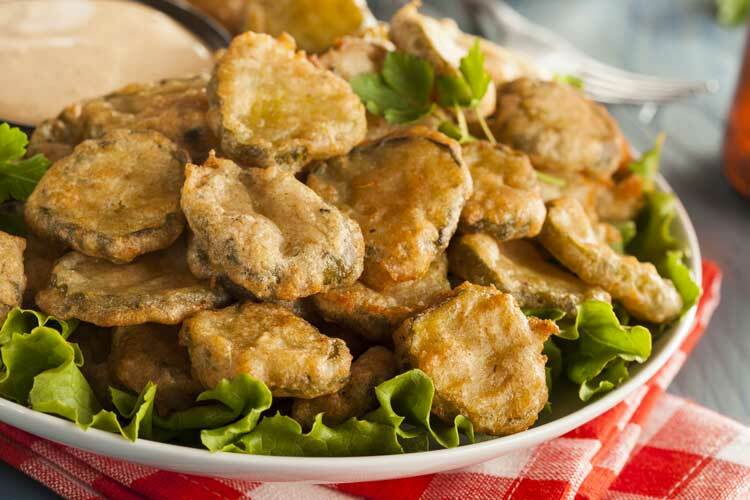 Fried pickles came into popularity in the Southern U.S. during the early 1960s. Bernell “Fatman” Austin is often cited as the inventor, having added them to the menu t the Duchess Drive In located in Atkins, Arkansas in 1963. Legend has it that The Fatman’s now infamous recipe is closely guarded by his family and only used once a year for the annual Atkins Picklefest. 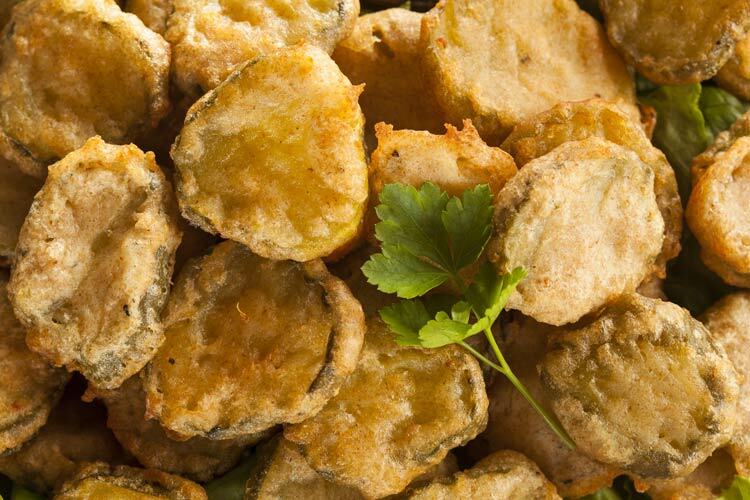 Interestingly, the first known printed fried pickle recipe was not published in the South. The Oakland Tribune featured a recipe for “French Fried Pickles” in their November 19, 1962 edition. That recipe called for using sweet pickle slices and pancake mix (which sounds amazing!). How to Make Fried Pickles Recipe – Deep Fry Them! The best deep fryer for home use in my opinion is an electric fryer that uses low oil and is dishwasher safe. Friends, if I had found this fryer years ago, I probably would have fried more food on occasion. I’m not huge on fried food, but it sure does taste good and my family LOVES it. Between fried pickles and Fried Mozzarella Cheese Sticks, you better believe we get our money’s worth out of our fryer. If you’re a fried food lover, you will really enjoy biting into one of our deep fried pickles. They are really a treat. Seriously…the next time we make these, we’re going to make Bubba Gump’s Popcorn Shrimp, Mozzarella Sticks and Fried Pickles. All kinds of yummy happening with that idea! You’ll want to eat your fair share of this delicious appetizer recipe, so make sure you save enough room! And speaking of fairs, fried pickles are definitely one of the star attractions at state fairs and food festivals. Whether eaten as an appetizer or as an accompaniment to other dishes, the delicious combination of tart dill pickles and crunchy crispy coating is always a crowd favorite. And fried pickles chips are a perfect bite-sized snack for eating on the go — no fork required. 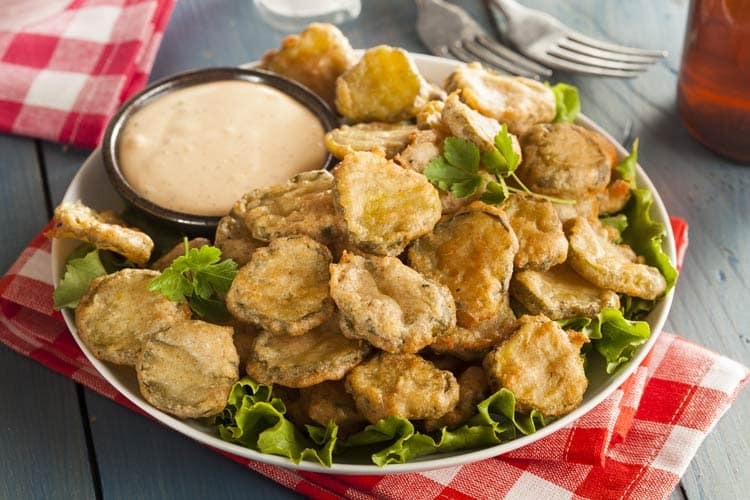 Fried pickles are commonly served with ranch dressing or another creamy sauce for dipping. The zesty seasoning in the dip featured in this recipe deliciously complements the tangy pickles. You’ll want to make this recipe again just to get another taste of the dip. Yum! 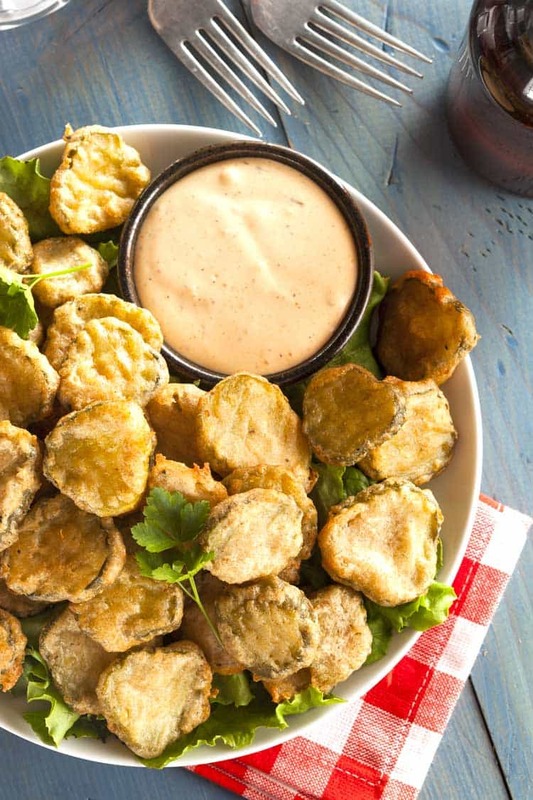 It's easy to make these crave-worthy Copycat Fried Pickles at home! Preheat oil to 375 degrees. In a small bowl, mix all the dip ingredients. Set aside. Place about 1 1/2” of vegetable oil in a wide pot and heat over medium high heat. In a medium bowl, mix flour, Cajun seasoning, oregano, basil, pepper and salt. Depending on how big your pot is, you may have to fry the pickles in 2 batches. You don’t want the pickles to overlap when they’re frying, so make sure you have enough space. Coat the pickles with the flour mixture and shake off excess. Gently add the pickles to the oil, one at a time. Fry for about 2-3 minutes or until golden brown. Remove pickles with a slotted spoon and drain on paper towel. Repeat with another batch, if necessary. Serve right away with dipping sauce. I where is the recipe? Scroll down for the recipe. I double-checked and it is there. Thanks! I scrolled down as far as I could go and did not see the recipe. Hmmm. I just looked at it again on my computer and it is right there without much scrolling. Sorry you are having problems getting to it. a little bit down from the top there is a pic of pickles on a plate and under that it says read more. you have to select that then scroll down a little. i didnt see it at first either. towards the top under the pic of pickles on a plate it says read more you have to select that then scroll down. i didnt see it at first either. It would be nice to know what temp the oil should be for this. Hi Mike. Heat the oil to 375 and you’ll have perfect deep fried pickles. I’ll update the recipe with this info. Thanks for the note. You were able to make these in your air fryer? I’ve often wondered if it would be possible, I thought you needed to use frozen food. Great to know, can’t wait to try these! Those look great! I’ve never had the Texas Roadhouse ones, but I’m a sucker for anything with pickles in it! These look easy to make too- thanks for sharing the recipe! These look so good, but I also can’t find the recipe! I even looked for a ‘read more’ tab! Would anyone be willing to post the link for me!! Thanks in advance!! Thanks for letting me know! The recipe is visible again. I was doing a little bit of updating to the website and it inadvertently got taken down. These look so great. 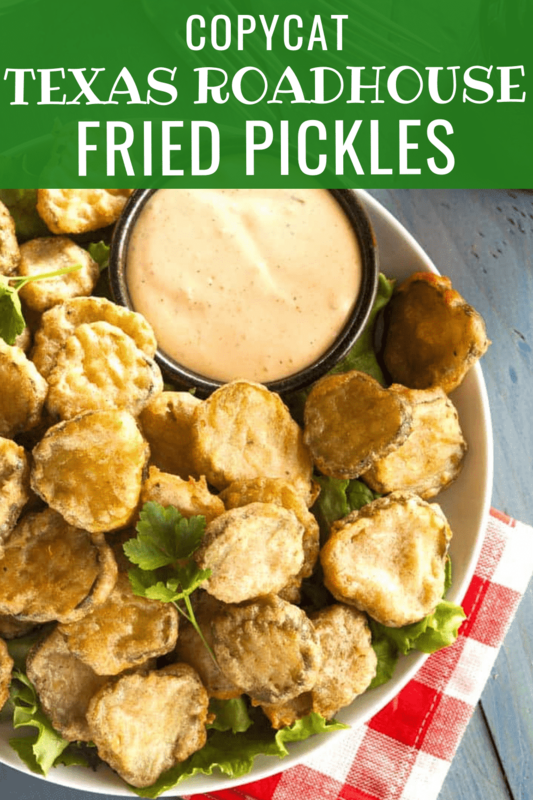 I’ve never actually tried fried pickles before but after seeing this I think I might just dive into the deep end and make them myself! I would probably use ketchup primarily because that is my main condiment of choice! Thank you for sharing! Why did you preheat the oven if you’re just frying them in a pot? What’s suppose to go in the oven? The recipe says to preheat the oil, not the oven. Using a fryer, make sure the oil is preheated to 375 degrees for optimal cooking. Enjoy! Were you ever able to do these in an air fryer? Did you use a air fryer? Or more like a fry daddy? You can do it with either and I’ve done it with both. I can’t wait to make this for a housewarming party this weekend! Do you have any recommendations for mayo substitutes? I don’t have a specific brand that I use. So if we eat 4 of the fried pickles it 200 calories?